Your client experience starts before you actually have a chance to talk with your potential new clients, so making a strong first impression is important. And, our auto-responder feature gives you the ability to kick off your client experience just moments after someone reaches out! With a customizable message, name tokens, and the ability to attach your brochure, your leads will get to know (and love) you right away! To set up your auto responder simply click the Settings menu from your Pro Dashboard and then Leads. From there, click on Contact Forms to the left. Next, select the contact form you'd like to set up an auto-response for. 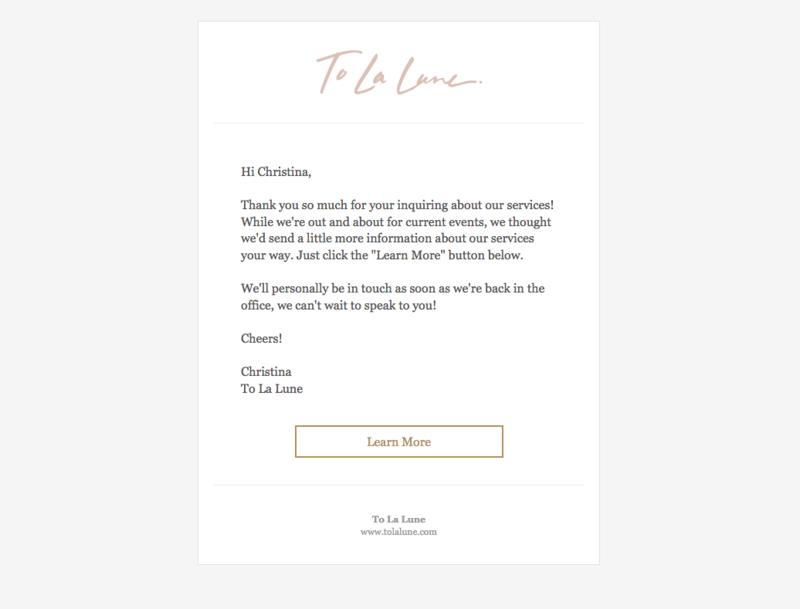 Note: If you haven't set up your Lead Contact Form just yet, you'll want to do that first. Learn how here. Once you've clicked into the Contact Form you, scroll down to the Auto Response section. Once you're there, all you need to do is edit the subject, message and attach your brochure. The default message includes tokens for the recipient’s name and your organization name, but we recommend that you put your own personal spin on this email and make it your own. As far as attaching your brochure, you can attach any document template that you've created in Aisle Planner as long as it does not require a signature.